Mn/Co/Ni-modified BaBiO3-based negative temperature coefficient (NTC) ceramics with the formula, x[(3-y-z)Mn/yCo/zNi-ions]+(1−x)BaBiO3 (x = 0.0–0.4, y = 0.96 and z = 0.48), were synthesized using a conventional solid state reaction. 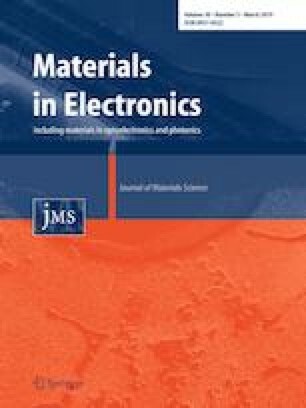 The effects of Mn/Co/Ni-substitute content on the phase structures and composition, microstructures and electrical properties were characterized by X-ray diffraction (XRD), scanning electron microscope and resistance–temperature measurements, respectively. XRD pattern analysis results revealed that the compound phases consisted of a main monoclinal BaBiO3 phase and a secondary phase of Ba(Mn, Co, Ni)O3 solid-solution with a hexagonal structure, which were detected at x = 0.05–0.2. In addition, according to the XRD patterns, the main phase changed from BaBiO3 to a rhombohedral Bi8.11Ba0.89O13.05 phase at x = 0.3, and this phase content increased dramatically as the x value increased to 0.4. For the related electrical properties, all of the samples demonstrated the typical characteristics of NTC thermistors across a relatively wide range of temperatures. The values obtained for B constant (B25/85) and the room-temperature resistivity (ρ25) were in the range of 2297–5235 K and 760 Ω cm−1, 620 kΩ cm, respectively, which implied that the electrical properties of the present ceramic systems could be optimized via various substitutions in the Mn/Co/Ni-ions content. The variable values of ρ25 were affected strongly by the changes in crystal structure and the decrease in charge carrier concentration. These composite ceramic materials are suitable candidates for a variety of NTC thermistor applications due to their widely adjustable electrical properties. Financial support from the National Natural Science Foundation of China (Grants Nos. 51462005 and 61561011) is gratefully acknowledged by the authors.